One of the trickiest aspects of my living room makeover for Kim of Eat Sleep Wear was the fact that the space itself was essentially one big room—yet we needed it to serve multiple functions. In order to carve a sitting area, dining room, two entryways, and a storage vignette from relatively blank architectural envelope, all the furniture and accent pieces we chose had to work extra hard. After all, they weren’t just decorating the space, they were defining it! That’s why, in choosing rugs for this project, I spent even more time than usual combing the Jaipur Living site for my favorites from amongst their thousands of gorgeous options. Not only is the floor the foundation of a room, it’s also like a fifth wall; the simple act of laying down a rug can have as much impact as installing a new window! And in instances when the rugs will be in the same sightline as each other, they not only have to function well as individuals but as a team. 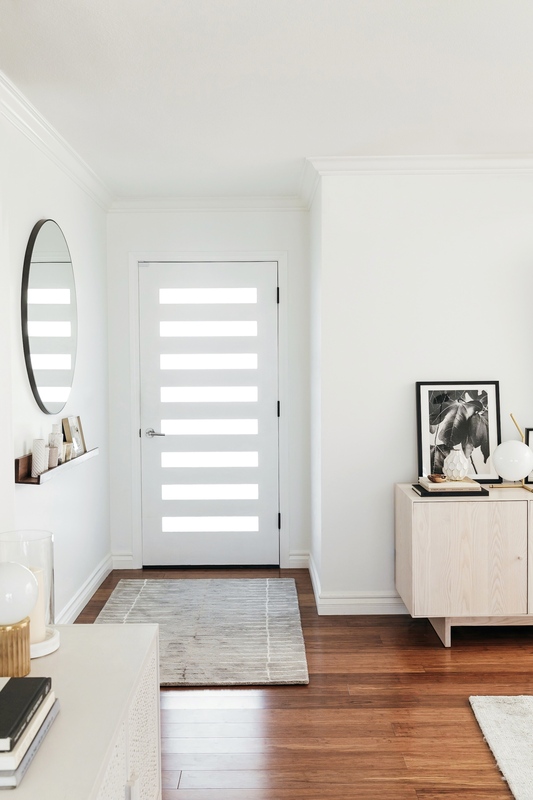 So when it comes to the question of how to pair rugs when creating an entryway and living room from one common space, here’s what to keep in mind! I always start by establish the role of each rug on its own. I consider how elements like color, line, and texture will subconsciously indicate how each zone is meant to function and feel. 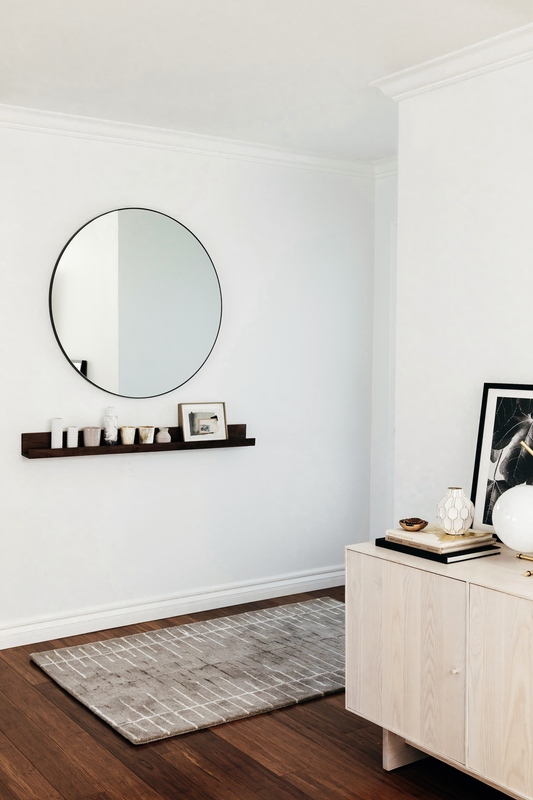 For Kim’s entryway, the job of the rug was threefold: to strike a welcoming note, to set the tone for the rest of the space, and to direct traffic from the front door into the main living space. I used Jaipur Living’s search filters to find several 3×5 rugs that had a slightly deeper pile for a plush, inviting feel—and that had subtle linear patterns to drew the eye inwards without distracting from the soothing vibe of the room as a whole. We ultimately chose a global inspired rug in the prettiest shade of mushroom. The ladder pattern beautifully echoes the window cutouts in the door, and creates a sense of dynamic movement through the entryway and into the sitting room. By contrast, the rug under the sofa is an anchoring moment. It’s job is to say, “Come in and stay awhile!” As well, for Kim, the seating area is the farthest from the windows and therefore gets the least amount of natural sunlight, so we also wanted the rug to have an illuminating effect. To that end, I chose from amongst Jaipur Living’s extensive range of 8×10 solids, honing in on the ones that had a striated but also slightly lustrous texture. Our final selection of this hand-looped grey rug is just what the decor doctor ordered! The ribbed pile softens the hardwood floors to foster our desired feeling of coziness, while the understated sheen reflects ambient light upwards to brighten the seating area. Of course, when I was choosing each rug from amongst my shortlists, I was also keeping in mind how they’d play together! I looked for a pairing that came from the same tonal family but that had a bit of contrast to it as well. Ultimately, the two rugs we went with contain threads of the same colors, so they feel related; but the darker entryway rug feels like a stepping stone from the outdoors to the alluringly light, bright living room rug. Here’s a few more examples of pairings I did when presenting options to Kim. I love where we ended up—but I also love these other combos enough that I’ll definitely be saving them for future projects!